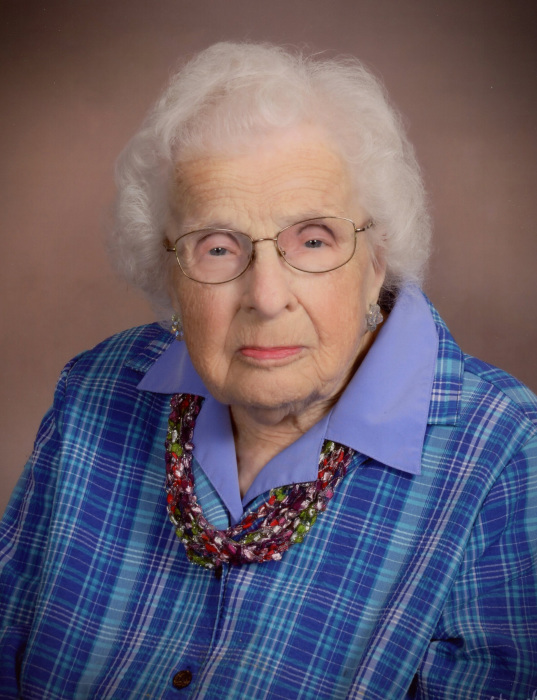 Lorraine E. (Holien) Posey, 96, of Dell Rapids passed away on Monday, April 30, 2018 at her home. Her Memorial Service will begin at 1:00 p.m. on Friday, May 4, 2018 in the Lutheran Church of Dell Rapids. Inurnment will be in the Bethania Cemetery, rural Trent. Visitation with the family present will be from 5:00 p.m. - 7:00 p.m. in the Chapel Hall at the Lutheran Church of Dell Rapids on Thursday, May 3, 2018. Lorraine Edith (Holien) was born on October 19, 1921 in West Jasper, Minnesota, the daughter of Oscar and Ida (Holter) Holien. She was baptized in Jasper Lutheran Church of Jasper and confirmed at Bethania Lutheran Church in June of 1936. She grew up in rural Jasper and attended grade school at Hermanson District #40 in Moody County. She graduated from Jasper High School in 1940 and then worked at Jasper Telephone Company and also worked as a telephone operator in Tucson, Arizona and Pipestone, Minnesota. Lorraine married Jerome Posey on July 12, 1949 at Jasper Lutheran Church. They worked as a farm couple near Sherman, Alpena, Canton, and Jasper, Minnesota and moved to Dell Rapids in March of 1963. She was a dietary aide at the Dell Rapids Hospital from 1963, retiring in 1998. She was active as a member of the Lutheran Church of Dell Rapids and her ELCA circle/bible study, quilting group and church choir for 50 plus years. She was very active in American Legion Auxiliary serving as secretary for almost 40 years. She enjoyed her 20 years of singing with Auxiliary sextette, The Quarrytones and had many happy memories of their times together. They especially enjoyed their performance at Mount Rushmore during the SD Centennial in 1989. She was chosen District Legionette of the year in 1999. She and Jerome were editors of the American Legion Post #65 newsletter for 16 years. Lorraine and Jerome enjoyed traveling to 6 or more of his E Company WWII army reunions and hosted 2 of these reunions in Sioux Falls. May of 2004 found them and daughter Jolene traveling to Washington DC for WWII memorial dedication. They also enjoyed wonderful trips to Alaska and Maine. She and Jolene enjoyed 10 plus years as members of the Red Rockettes Red Hat Group and made many good memories with these ladies over the years. She normally had a hat on her head and received many comments about these hats. She was a faithful Christian lady and encouraged her family to be involved in their community and church activities as they married and started having families of their own. Many family reunions were enjoyed and she was instrumental in reminding people of the date/time place every year. The coffee pot was always on at her house. Norwegian treats were special and she and her brother "Bud" recently enjoyed their annual lutefisk and lefse meal at her home. She also enjoyed making Norwegian wedding cakes for special birthday celebrations. She enjoyed her public TV shows Lawrence Welk, Minnesota Twins and spent this past winter putting together puzzles. She was a 60 year cancer survivor and participated in the Relay for Life for many years. She loved her children, grandchildren and great-grandchildren and always had a few pictures in her purse to show to anyone she visited or came to visit her. Lorraine passed away on Monday, April 30 at the age of 96 years. She was preceded in death by her parents, husband Jerome in March of 2014 and brothers Orvin, Art and Roy; sisters Idella, Dorothy and Ruth. Lorraine is survived by one daughter, Jolene (Gaylon) Wehde of Crooks, SD, three sons, Burdette "Boone" (Cathleen) Posey of Bruce, SD, Olin (Lynette) Posey of Trent, SD and Mark (Karen) Posey of Titonka, IA, seven grandchildren; Sarah, Laura, Nathan, Justin, Adam, Austin, Brett; seventeen great-grandchildren Dylan, Blake, Alyson, Katrina, Tyson, Ryker, Peyton, Hayley, Ruby, Reagan, Truman, Asa, Paxton, Jemma, Anna, Evan, and Seth; her brother, Arnold (Lois) Holien of Jasper, MN and many nieces and nephews.